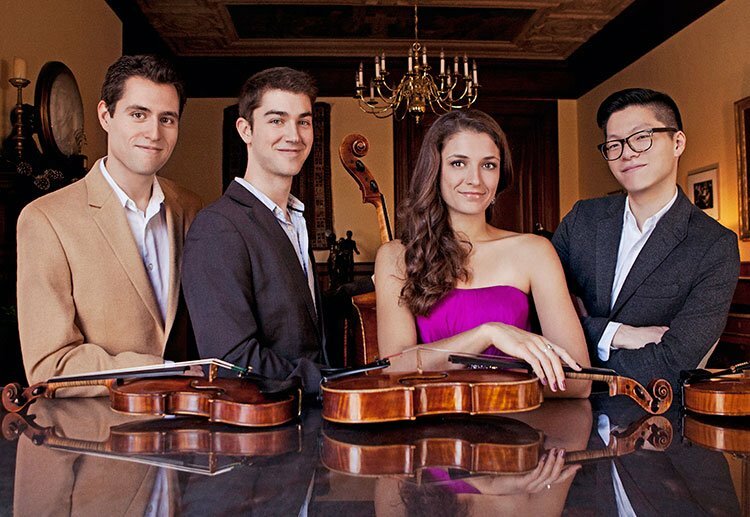 A buzzing crowd filled Pickman Hall on Wednesday as the Dover Quartet appeared in the Debut Series of the Celebrity Series of Boston with Tchaikovsky’s String Quartet No. 3 in E-flat Minor, Op. 30; Mason Bates’s From Amber Frozen (2004); and Dvořák’s last quartet, his No. 14 in A-flat Major, B. 193, Op. 105. The folk-influenced musical material ranged from stunning to amusing to downright thrilling. Tchaikovsky wrote his third and final work in the genre in 1876, as a memorial to a fellow faculty member at the Moscow Conservatory Ferdinand Laub, who played first violin in the world premieres of the composer’s other two quartets. Accordingly, the third opens with a slow, elegiac introduction, which gave melodic pride of place to the first violin, Joel Link, who played with a beautifully full, rounded tone. In the melancholy, lilting Allegro moderato that follows, Tchaikovsky breaks a big melody into multiple small fragments and divides it among the four players. The group handled this fractured tune beautifully, rendering Tchaikovsky’s melody seamlessly. The movement’s coda builds up to a moving climax, with all four strings playing at the top of their registers, then as though aware of grief run rampant, they rein in emotion, and return to the reserve and stateliness of the introduction, echoed by lower strings, and leading to a hushed end. The second movement Allegretto vivo e scherzando offered a change of pace with an insistent motor-like figure, and a deft switch from minor to major at its end. The Trio put violist Milena Pajaro-van de Stadt’s robust, singing tone and fine melodic shaping on full display. The third movement Andante funebre e doloroso constitutes the heart of Op. 30. The Dovers offered nicely tuned chords which brought out conspicuous suspensions and dissonances, deftly exchanged pizzicato figures, and displayed skilled dovetailing as pairs in the members exchanged musical ideas with each other, and a beautifully hushed, high pianissimo at the movement’s end was deeply poignant. In general, there was much to admire in these three movements, though I kept feeling like there was something missing, or being held back. Tchaikovsky’s moments of deep passion felt a little restrained, and there wasn’t the kind of digging into a part that I remembered hearing with this group at a classical cabaret at Shalin Liu this summer (reviewed HERE). Even the finale, with its abrupt change from a dark, minor key-dominated aesthetic to a muscular, sunny major key, and its brief recall of the mournful opening introduction didn’t bring out as striking of a contrast as I might have hoped for. Still, the closing pages offer a typical Tchiakovskian outburst of exuberance, which earned a warm ovation. Cellist Camden Shaw then spoke of how the Dover’s residency at the John F. Kennedy Center for the Performing Arts in Washington D.C. connected them to the Kennedy Center’s composer-in-residence, Mason Bates, who doubles as a deejay, laying down sick beats over classical counterpoint. The group took up Bates’s single movement, multi-sectional From Amber Frozen which celebrates amber’s capacity to fossilize fragments of evolution. Shaw likened Bates’s deconstruction of a melody to the way Beethoven scatters a tune among the four instruments in his late quartets. In Bates’s piece, by contrast, each instrument plays one note of the phrase before handing off to the next instrument. An emotional climax transitions to a French-inflected section, echoing Debussy and Ravel. Then the group deconstructs the tune further, removing pitches from the melody while keeping the rhythmic contours intact. Shaw likened the process to writing music on tin foil, putting the tin foil in a microwave, and recording that. It was amusing to hear a rhythmically complex Cuban jazz tune emerge from the barrage of pointillistic melodic fragments. The group deftly handled eerie switches to high harmonics, and slapping hands on the wood of the instruments, making much of the a sharp contrasts, as they traversed the work with impressive precision and unanimity. The opening of Dvořák Op. 105 again showed the ensemble’s remarkable ability to shift gears rapidly, transitioning seamlessly between major and minor, loud and soft, fast and slow. Individuals took the spotlight when they had solo moments before relaxing back into the texture to support their colleague’s turns to shine. The robust Bohemian folk rhythms brought out a gusto that I had missed in the Tchaikovsky. The second movement Scherzo, marked Molto vivace, crackled with energy, and the Trio had neatly dovetailed rapid-fire exchanges between the first violin/cello and the second violin/viola. The third movement worked variations from a stunningly rendered hymn-like theme, played with a sumptuous sound and buzzing with overtones. Transitional figures between the variations were typically led by second violinist Bryan Lee or cellist Shaw playing a repeated-note figure. But Lee in particular inflected that “one-note-wonder” figure with remarkable dynamic shaping, making for a sharply contoured melodic profile out of the most limited figure possible. And the finale had more blazing sunshine, as rapid-fire motivic exchanges with canon-like fugato alternated with homophonic sections. A thrillingly executed collective acceleration led to a thrilling finish. I am constantly amazed at how we seem to be in a golden age for great string quartet playing. Boston has hosted memorable performances by a range of highly polished, technically astounding foursomes. In this company, Dover can stand proudly, with its crisp execution, and enthusiastic give-and-take alchemy. Hear! It’s a wonderful thing to experience such masterful playing, especially in an ensemble so young. Myself, I’m also amazed at how much good, incisive writing on music is around, by professionals and true amateurs both, even as the print world stoops and narrows. Thanks to James Liu for making this superb program come alive again! Let me add one more thought: I think I enjoyed Mason Bates’ From Amber Frozen quite a bit more than Dr. Liu. Although cellist Shaw’s opening remarks could have been somewhat more focused, the ensemble’s way with the extraordinarily crafted ‘evolution’ of the piece’s DNA could hardly have been more vivid or moving. My impression: a work of genius by a composer who is defines ‘sui generis’. Not just I, but a few others seated nearby, wanted to hear it again immediately, and shared the hope at program’s end that the Dovers might reprise it as an encore. More, please!